Within a three-hour drive across Oregon, you can visit a beach, a temperate rainforest, a mountain glacier, and the high desert. The diversity of the landscape is mostly driven by the interaction of air masses and the mountains. 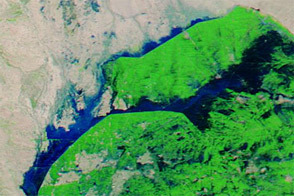 This image from the Landsat 5 satellite (bands 5, 4, and 3) was acquired on October 27, 2011. 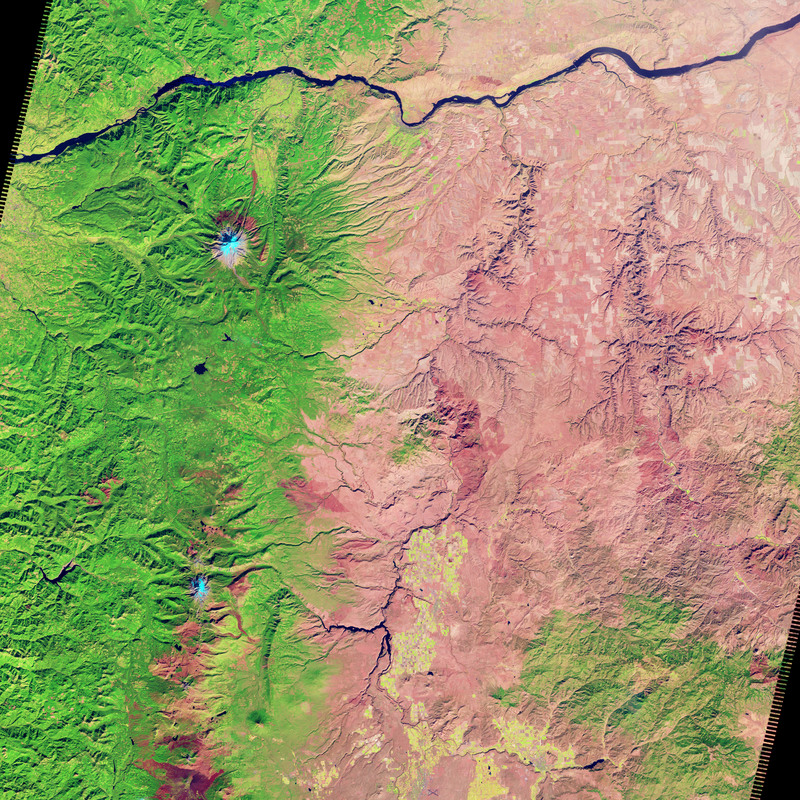 The false-color view shows the high desert—bare soil and sparse vegetation appear in shades of brown and pink—and the deep green vegetation on the west side of the Cascade Mountains. The one blue spot is the glacial cap of Mount Hood. The transition from green to brown is indicative of a rain shadow. Winds blow in from the west, carrying moisture from the Pacific Ocean. As the air moves across the landscape and up into the high elevations of the Cascade Range, air pressure decreases. The air cools and becomes unable to hold as much moisture, causing water to fall out as rain or snow. For this reason, the Cascades spend most of the year blanketed by cloud cover, and the frequent precipitation provides ample water for lush vegetation and gigantic trees. On the eastern, leeward side of the mountains, the elevation drops, the air warms, and the air pressure increases. This effectively shuts off the rain because the air can better hold the remaining moisture. This effect is called a rain shadow and is largely responsible for the desert landscape beyond the mountains. 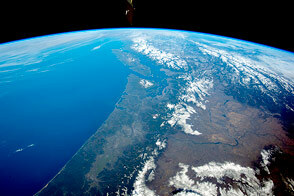 NASA Earth Observatory (2012, May 20) Sunny Skies Over the Pacific Northwest. NASA Earth Observatory (2012, April 5) Where is the Hottest Place on Earth? 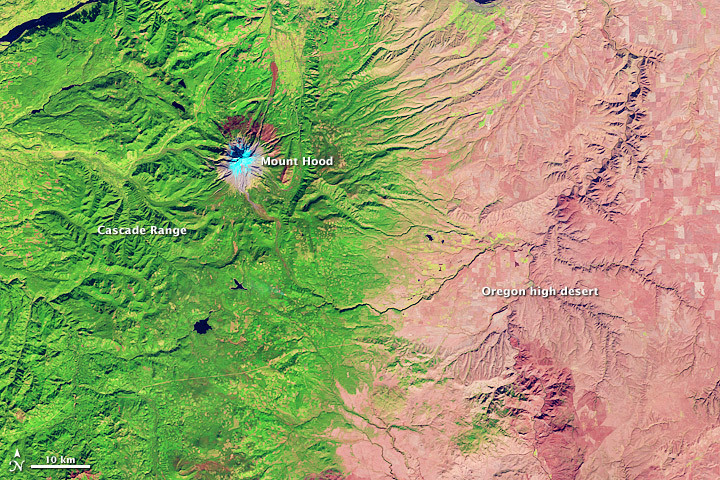 NASA Earth Observatory (2009, August 17) Mount Hood, Oregon. Wild Pacific North West (2011, June 20) The Rain Shadow Effect in the Pacific Northwest. 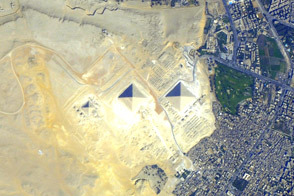 Accessed September 14, 2012. NASA Earth Observatory image by Jesse Allen and Robert Simmon, using Landsat data from the USGS Global Visualization Viewer. Caption by Tassia Owen. Within a three-hour drive across Oregon, you can visit a beach, a temperate rainforest, a mountain glacier, and the high desert.